Learn how you can create a virtual machine of your existing computer with all the software programs. You can open this virtual machine on any computer using Virtual PC, VMWare or VirtualBox from Sun. Virtualization, in simple English, is a useful technology that helps you run multiple operating systems on the same machine. For instance, if you are running Windows 7 on a computer, you can create virtual machines for Windows XP or Ubuntu Linux and run these operating systems on your existing Windows machine just like any other Windows application. Windows Virtual PC, Virtual Box and VMware Workstation are some popular applications that allow you to create new virtual machines on a Windows PC but the only problem with these programs is that they require you do everything from scratch. That is, if you want to create a new virtual machine, you will have to install the whole operating system first using the original installer DVD and then configure it with your favorite programs. This can be both time consuming and difficult. What if you could use your existing Windows computer, that already has all your favorite programs installed, and turn into a virtual machine? While it has always been possible to convert an existing hard drive into a virtual machine, the process was difficult and often required expensive programs. Well, not anymore. There’s a new utility from Microsoft that makes it both simple and free to convert an existing installation of Windows into a virtual machine ready to run on any other computer. Microsoft’s Sysinternals team has released a simple application called Disk2vhd, that lets you easily migrate an existing computer to a virtualized hard drive (VHD). It’s a tiny utility doesn’t even require instillation. 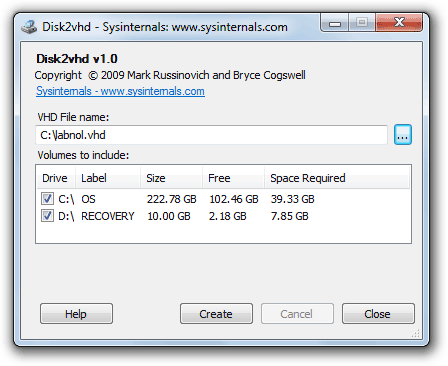 When you run Disk2vhd, it will immediately show you all the drives and partitions on your computer that it can migrate to a VHD. Simply select a drive that you wish to create a VHD file from and click “Create.” Disk2vhd will convert the hard drive into a VHD file even if the computer /drive is currently in use. When the Virtual Machine VHD file is created, you can run it in any desktop virtualization program including the free Windows Virtual PC, Virtual Box, or VMware Player. You can also mount the virtual machine as a standard hard drive in Windows 7, and can even boot from it if your computer is running Windows 7 Ultimate. You may use Disk2vhd to create virtual machines of your Windows XP, Windows Server 2003, Windows Vista and higher machines, including x64 systems. Let’s say you have a computer that is already running all the software programs you frequently use, but you now want to move to a new computer or upgrade your operating system. You can then consider creating a virtual machine of your old machine using the Microsoft utility and this will help you use all your favorite programs (with the same settings) on the new machine. You can also use virtualization to create a ghost image of your hard drive in a single file and this will be handy in the event of a disk failure. Disk2vhd is an useful tool that will make it much easier for you to enjoy the benefits of virtualization without being too technical.